Assigns a function to onkeydown. The document.onkeydown attribute is a special property. If you assign a function to this property, that function will be automatically called each time the operating system recognizes a key press. This example assigns the function updateKeys. Creates the function, including an event parameter. The updateKeys() function will automatically be given an event object (normally called e). Determines which key was pressed. The e.keyCode property returns a numeric code indicating which key was pressed. In the keyDemo program (as well as simpleGame), the currentKey variable holds this numeric value. Compares the key to one of the keyboard constants. It’s hard to remember which keys are associated with which numeric values, so keyDemo and simpleGame provide a list of keyboard constants. They are easy to remember: K_A is the A key, and K_SPACE is the space bar. Of course, you can add other keys if there’s some key you want to use that isn’t available. You can achieve a form of interactivity by having an image move in response to keyboard motion. 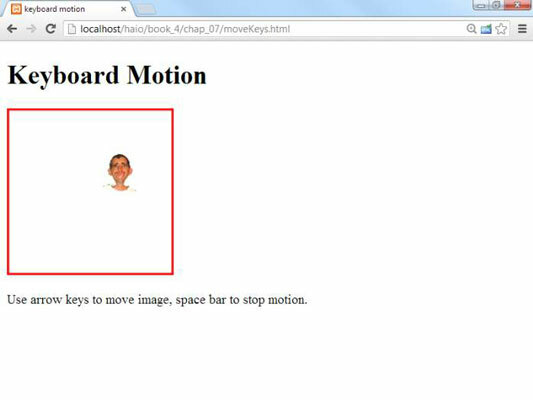 Use arrow keys to move image, space bar to stop motion. 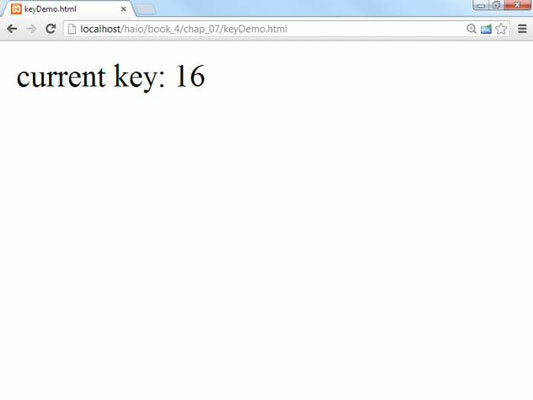 Sets up updateKeys() as an event handler. Because this program reads the keyboard in real time, you have to assign an event handler. Store the last key pressed in a variable called currentKey. Compares currentKey with keyboard constants. Use constants to compare currentKey with whatever keys you’re interested in — for now, the arrow keys and space bar. Changes dx and dy based on the current key value. When you know which key is pressed, use this information to modify the dx and dy values, which determines how the image moves. The draw() function still does the drawing. The draw() function is called on a regular interval. It’s common to separate input (keyPressed) from animation (draw).